It might be the ultimate in tourist activities, but I finally got to ride a bike across the Golden Gate Bridge in San Francisco earlier this year. And I treated Mom as a pre-Mother's Day present. We had a beautiful sunny afternoon for our grand adventure. We rented bikes from Blazing Saddles, one of the big bike rental companies in San Francisco. They give you directions on how to ride to Sausalito, of if you're more industrious you can bike to Old Mill and see the big trees or go to Tiburon. They even provide you with a ferry ticket if you want to take the ferry back from Sausalito - if you don't use it, you don't pay for it (Fun Fact: despite the fact that it's a Blue and Gold Ferry ticket, you can also use it on the Red and White Line). On the bridge you have to be careful of the pedestrians. The path is divided in half. That implies that one half is for bicycles, but there are a bazillion tourists walking 4 across. There are also serious road bikers who are not interested in your lollygagging along the bike path when they are trying to go somewhere. 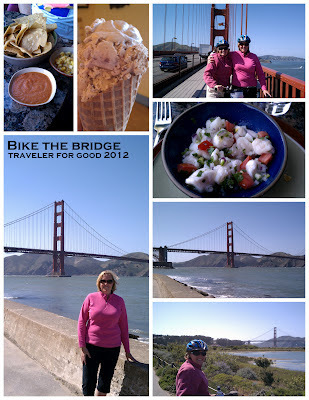 After you cross the bridge you get on the road and cruise downhill into Sausalito. You only need to walk your bike if you are on the sidewalk. The signs might be confusing to you. Don't get off your bike and miss rolling down into town unless you are afraid of riding down the hill. In Sausalito there is designated bike parking by the ferry terminal, so lock up your bike with the provided lock and enjoy yourself. What a great way to spend a day at the city on the bay!